Saturday, June 10 – 5 to 8 P.M.
A tall, animated young man in his early twenties, wearing denim cut-offs, flipflops and a black tee emblazoned with a neon-green, eight-legged grasshopper, smiled brightly into Daisy’s self-absorption with her first exhibit since she’d completed an MFA three years before. The young man’s observation was on target. Her newest obsession was indeed Louise Nevelson as Daisy’s paintings attested. Daisy was fascinated by Nevelson’s sculptures of everyday objects painted uniformly and fitted into similarly colored boxes stacked in random patterns. In homage to those sculptures, Daisy’s paintings pictured ordinary things within a flat, monochromatic grid of squares and rectangles. And as she had done before, when she had been enamored of Alice Neel and then Georgia O’Keefe, Daisy also appropriated the dress and manner of her mentor-of-the-moment. Tonight her petite 5′ 2″ frame was draped in a Nevelson look-alike: a black silk tunic edged with multi-colored ribbon over flowing, silver-grey culottes. Her hair was wrapped in a pale green scarf with a small diamond design in a contrasting green. The result was something between Janis Joplin and a Romanov princess. Daisy surveyed the early visitors as she sipped her drink. She recognized a few people even if their names didn’t jump immediately to mind. Her mother hadn’t arrived yet, nor her father and his new wife. But they’d all promised to come, and the evening was still young. Happily, Daisy March was young, too, twenty-seven at her next birthday. So much was possible. Or it would be as soon as she solved her current dilemma. Daisy was only casually acquainted with the other two artists who shared the exhibit. Cheryl painted delicate, floral pastels and Lena made torn paper collages in screaming shades of orange, purple, or lime green. Daisy admired their work as she finished her champagne and looked for a place to set the empty glass. “You’re prejudiced, Mother,” Daisy said, returning the hug. The gallery was getting much too warm for Daisy, and she unexpectedly felt claustrophobic with so many people milling about. She headed for the side door to get some air, but was stopped short when she saw Kyle leaning against the receptionist’s desk listening attentively to a blonde with narrow hips in a mini skirt and a tight tank top. A smile played slyly and deliberately across his face. Daisy remembered too well how quickly Kyle’s charm could lead to his bed. She watched him now as he nodded compliantly, arching one eyebrow in a familiar expression of attentiveness. Much as she regretted it, he was irresistible with his globally-defined good looks—a Nordic profile and Mediterranean coloring—and his Oriental inscrutability (one great-grandmother had been Chinese). Daisy caught his eye. He waved, nodded to the blonde, and crossed the room. “Sure,” Daisy said, amazed when she thought about it later that she hadn’t paused, never missed a beat despite her shock that she’d known nothing about her father’s wife’s pregnancy. So now she knew the great news her father had promised to tell her last week over a dinner he’d canceled at the last minute. No surprises there. Howard March continued to be a busy obstetrician as his family fell to second place. Well, at least he’d planned to tell her himself, didn’t mean for her to hear that Marcie was pregnant as gossip from just anyone, like an ex-boyfriend Daisy would rather forget. Daisy doubted her mother knew about Marcie’s pregnancy and telling her might be the hardest thing Daisy had ever done. Well, maybe the second hardest. She had yet to confess her own predicament. Poor Mother March was heading into a few very trying days! “I’ll walk you out, Mom,” Daisy said hooking her arm around her mother’s waist but neglecting to add that she still needed the fresh air she’d headed for earlier when Kyle waylaid her. “Something important?” her mother asked. “It can wait,” Daisy said. Daisy watched the car disappear around the corner. She both pitied and admired her mother in a singular rush of emotion that left her almost breathless and feeling as queasy as she had earlier. Daisy was worried how her mother would react to the news that not only Marcie, but Daisy, herself, was cocooning a living work of art. Of course, she would tell her father tonight, but she wasn’t certain of his response either, although she hoped they both would be happy for her and help her raise the first member of the next March generation. What she didn’t want was for either of her parents to insist she tell Kyle—the obvious candidate for paternity—or offer to pay for an abortion. The baby would be Daisy’s greatest creation, and she had no intention of forfeiting it or sharing it with an outsider. And Kyle was now every bit an outsider. Once gone from her bed and eventually her desire, his less than perfect attributes loomed large. Kyle liked being the boss, the alpha dog, Mr. Macho Man in charge. Daisy preferred to avoid confrontation whenever possible so she went along. Actually, if she were honest with herself, she had once rather enjoyed playing the farmer’s daughter to Kyle’s snakeoil salesman. At the edge of the parking lot, adjacent to the back of the gallery, was a small garden with a few stone seats interspersed among both figurative and abstract sculptures. It was empty. Fighting a wave of nausea, Daisy slumped heavily onto the nearest bench and promised herself it would be for only a few moments to catch her breath. However, instead of becoming more relaxed, Daisy’s agitation increased. To calm herself, as she had done many times before, she picked up an imaginary brush and considered: What would it look like, what I’m feeling right now? Daisy closed her eyes and lifted her hand to stroke an imaginary canvas with her imaginary brush. First her mother emerged as a startling yellow canary with blue wing-tips and a green beak. She was sitting on the window sill looking at a laughing baby dressed in pink lace lying on her back on the floor swinging a multi-colored rope from which dangled multiple pale yellow moons. Kyle was a broken Pinocchio puppet flopped over a red bench in the upper corner, and her father and Marcie were purple irises poking out from a white ceramic vase. Daisy sighed and dropped her hand into her lap. Then she stood and leaned back against the rough brick of the building, gently massaging her shoulders against the wall while stroking her stomach in slow, rhythmic circles. She looked up at the few stars just beginning to show. Daisy paced the little garden, winding her way between the sculptures, drawing her fingers against the surface of each. Babies are beautiful, she thought, and pictured herself and her infant in an Impressionist painting by Mary Cassatt. Daisy had long admired the tender affection of Cassatt’s mother-child scenes: before the bath, in the bath, after the bath. She slid the scarf off her hair and let her long, amber curls tumble to her shoulders. She smiled. Of course. That was it! She would paint mother and daughter wearing matching lacey white dresses. Daisy would have a pale blue shawl like the one in Cassatt’s The Oval Mirror. There were no fathers in Cassatt’s tender paintings. Did that imply that men were superfluous after the fact, or more accurately stated, after the act? At the thought, Daisy giggled like a schoolgirl. Suddenly she felt much better, not the least bit queasy. In fact, she felt formidable and happy. Tomorrow she would talk to her mother and somehow convince her that Marcie’s pregnancy was a felicitous event. Then Daisy would tell Mrs. March about her own pregnancy. Smiling to herself, Daisy walked back across the parking lot and reentered the gallery, hoping her father and Marcie had arrived. She couldn’t wait to tell them how thrilled she was about the baby. 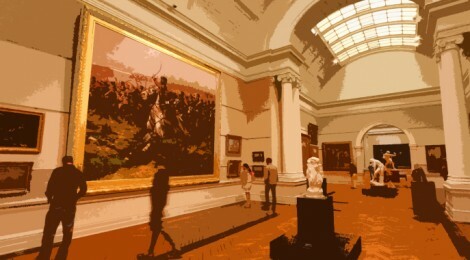 Image adapted from: Flickr, “Art Gallery of NSW, Interior” by username: Wenjie, Zhang (trioptikmal), under the Attribution-NonCommercial 2.0 Generic license. Caryl Sills is a retired English professor who has turned her hand to fiction. Her stories have appeared in various publications, such as Mobius, Foliate Oak, and First Edition. Caryl lives on the Jersey Shore with her husband, a retired surgeon, and their fox terrier, Dylan. Their sons and grandsons visit often.